WHEREVER Scottish troops have fought the sound of the pipes has been heard, speaking to us of our beloved native land, bringing back to our memories the proud traditions of our race, and stimulating our spirits to fresh efforts in the cause of freedom. The cry of "The Lament" over our fallen heroes has reminded us of the undying spirit of the Scottish race, and of the sacredness of our cause. 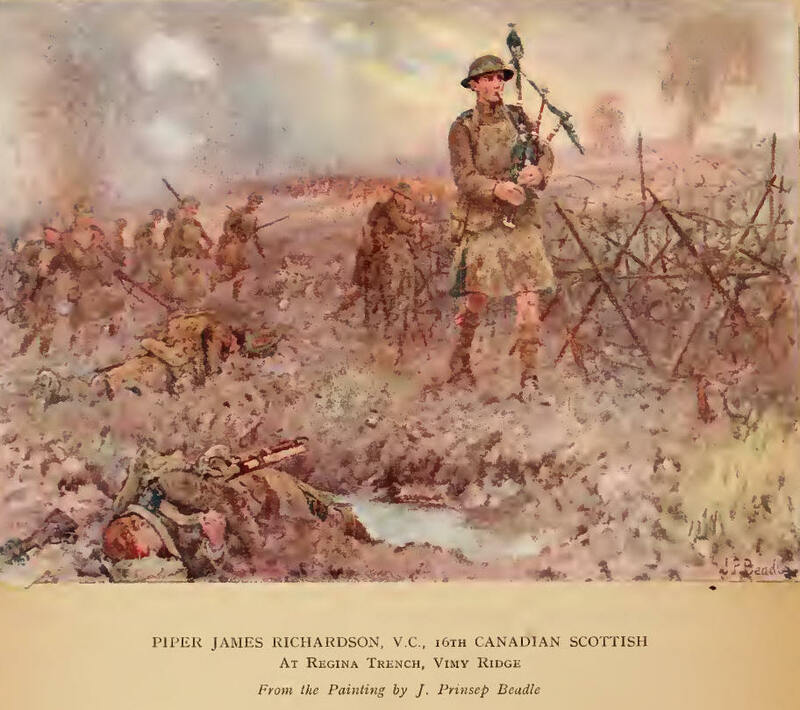 The Pipers of Scotland may well be proud of the part they have played in this war, in the heat of battle, by the lonely grave, and during the long hours of waiting, they have called to us to show ourselves worthy of the land to which we belong. Many have fallen in the fight for liberty, but their memories remain. Their fame will inspire others to learn the pipes, and keep alive their music in the Land of the Gael. 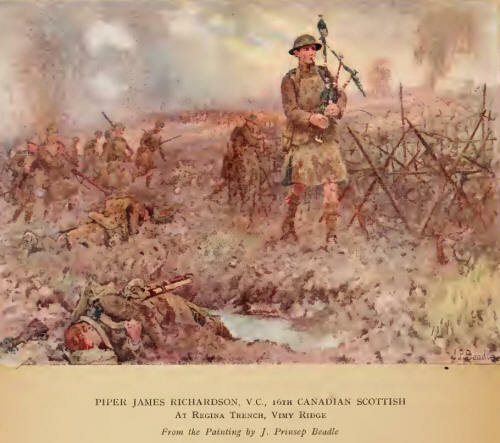 This record of the achievements of pipers during the war of 1914-18 is not intended to be an appeal to emotionalism. 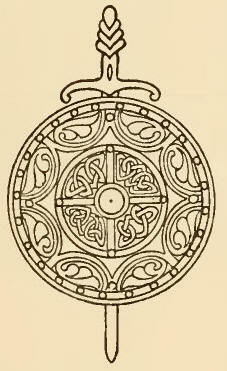 It aims at showing that, in spite of the efforts of a very efficient enemy to prevent individual gallantry, in spite of the physical conditions of the modern battlefield, the pipes of war, the oldest instrument in the world, have played an even greater part in the orchestra of battle in this than they have in past campaigns. The piper, be he Highlander, or Lowlander, or Scot from Overseas, has accomplished the impossible—not rarely and under favourable conditions, but almost as a matter of routine; and to him not Scotland only but the British Empire owes more than they have yet appreciated. In doing so he has sacrificed himself; and Scotland—and the world— must face the fact that a large proportion of the men who played the instrument and kept alive the old traditions have completed their self- imposed task. With 300 pipers killed and 600 wounded something must be done to raise a new generation of players; it is a matter of national importance that this should be taken in hand at once, and that the sons of those who have gone should follow in the footsteps of their fathers. This is the best tribute that can be offered to them. The Piobaireachd Society intend to institute a Memorial School of piping for this purpose, and all profits from the sale of this book will be handed over to their fund. The compilation of the statistical portions of the work has involved correspondence with commanding officers, pipe presidents and pipe majors of many units in the Imperial armies; to them, for their enthusiastic assistance in obtaining information, is due the credit for the mass of detail that has been made available. To the other contributors—authors, artists and poets—is due in large measure such success as may follow the publication of this work. They have helped a cause worthy of their efforts. It is earnestly to be hoped that Scotland will rise to the occasion. To the compilers it has been a privilege to record the achievements of men— many of them personal friends—who contributed so largely to the success of their gallant regiments. B. S. & J. G.
The Pipes: Onset. By Joseph Lee, Lieut.